Chris and Jamie pepper the episode with their newly coined “News Of The WHAT?!? 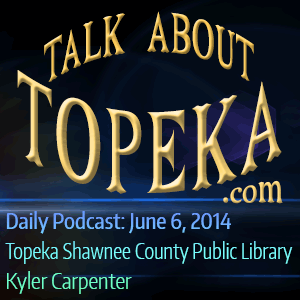 !”… They also discuss all the great stuff happening this summer at the Topeka & Shawnee County Public Library with Lisa Coble-Krings and Kyler Carpenter. Kyler gives a musical performance of “Library Time” and Kerrice Mapes dropped by to discuss some upcoming weekend events. Chris & Jamie close the episode talking about their plans to attend the Mulvane Art Fair on Saturday.